I'm a big Taylor Swift fan. I have no shame in that, I've been a fan since the beginning and expect to always love her tunes. So, naturally, when her new cd was released, I wanted it. Bad. I think it might take me a little while to warm up to these new songs since I don't know all of the words yet, etc...but after seeing a bunch of reviews (which aren't all very kind) I felt like I wanted to put my own viewpoint out there. First of all, I think it's important that before listening to this new record to understand that Taylor's sound has changed a lot since her first album. Just like other artists, as she has matured and changed, so has her music....AND she's only 22, people! Just keep that in mind. Like other artists, such as The All-American Rejects, her sound has changed...she doesn't sound like the 16 year old she was when she became popular. And if you don't like it, stick to her first couple albums. Here's my take on each song on this new album, entitled "Red". With 16 tracks, I do believe that this is her longest album. Disclaimer: I'm only giving my take on the sound of her album, because giving my opinion on the words and meanings, etc of her songs would be more than 12 posts themselves. 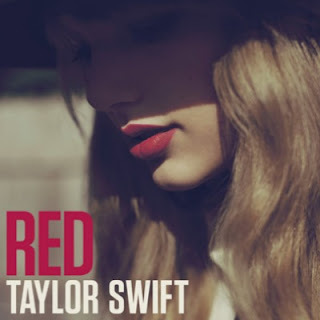 Red - I like this one a lot...there are little banjo-twangy sounds but slightly more poppy than the first song. Treacherous - meh. slow, not a big fan....and for some reason it just annoys me. I Knew You Were Trouble. - LIKE. poppy and slightly angry...but I like it. All Too Well - another slow one...more of a country feel, but I get bored and move on to the next track. I Almost Do - I really like this one...it's slower, but the sound is nice and clean. We Are Never Ever Getting Back Together - definitely a dancing-in-the-car song. a huge high-school feel, but it's fun. Stay Stay Stay - LOVE. It's poppy and cute and potentially annoying. But I like it. A lot. The Last Time - I hate the beginning of this song...it's whiny and almost off-key. But if you stick with it until the middle of the song, it's fab. Holy Ground - gross. don't like. Sad Beautiful Tragic - slow. I'll be honest, I haven't listened to the entire song because it annoys me. The Lucky One - LIKE LIKE LIIIIIKE. doesn't sound like anything Taylor has ever written before. and I like that. Everything Has Changed - I LOVE THIS SONG. LOVE IT. Starlight - ugh. no. again, haven't listened to the entire song so maybe it's not fair, but I don't like what I've heard. Begin Again - again, like The Last Time, the beginning is annoying but if you wait until the chorus, I really like it. Overall, I only really like 10 of the 16 tracks on this new album. Meh. I mean, I don't expect to like EVERY song...although there are some artists whose albums I can listen to from beginning to end and love every song (think OK Go)...but at the end of the day, I'm happy with this album. Is it very different from what you might expect from Taylor Swift? Yes.